I'd love to regale you with tales about our recent adventures but we've done little else than work and shop. My unoperated hip's been a bit of a nightmare since we got back from Greece (I blame those steps at Askeplion) so anything that involves more than walking a very short distance is pretty much off limits at the moment. No exercise, no platforms, loads of painkillers...boring! Vintage Village wasn't a great success sales-wise but we had a laugh and, as always, caught up with a few pals and picked up some great stuff. My vintage nightie and Mum's 1960s Biba boots caught the eye of fabulous fair photographer, David Kennedy. After watching Stacey Dooley's horrifying documentary about the catastrophic effect of fast fashion on the planet I'm delighted to see that hugely influential people like Ari Seth Cohen, the man behind the legendary Advanced Style blog, are discussing the need to reconsider our appetite for fast fashion (HERE). 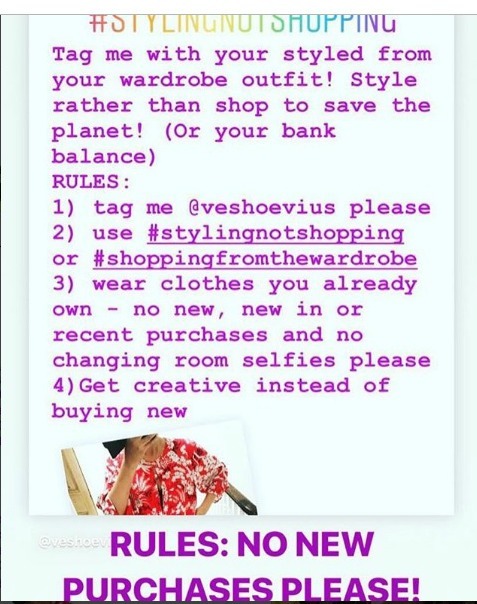 My friend Michelle, who used to blog at The Taxonomy of My Wardrobe, is encouraging Instagrammers to eschew the new and style their existing wardrobes instead. Although most of the people I follow on IG are secondhand/vintage shoppers it's refreshing to see familiar clothes worn in different combinations and to read the stories behind much-loved pieces. Here's yesterday's contribution - a vintage housecoat, 1970s corset belt & reversible Indian block printed quilted jacket, a charity shopped hat and a Banjara tribal necklace - all items I've owned for ages (and years, in some cases). 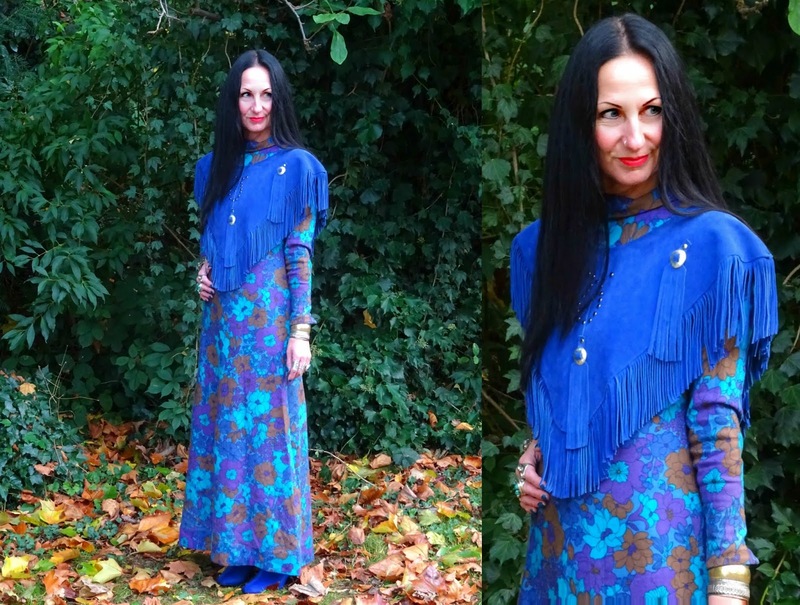 Today it's the turn of my vintage Collier Campbell wool maxi (previously seen with a matching marabou feather trim capelet) which I've teamed with a 1970s fringed suede cape I bought from fellow Moseley Vintage fair trader, Lost Orchid Vintage Store at the start of the festival season. Please join in with Michelle's quest and let's show the world that you don't need an endless supply of new clothes to have style. If, like me, you're not a smartphone owner, you can post to Instagram on your PC via Gramblr - it's safe to use and you won't be inundated with spam and no, I'm not being paid to advertise it! While I've been wearing secondhand clothes since I was a child and posting my vintage finds and outfits on my blog for almost a decade, I have to put my hands up and admit that even I have succumbed to the lure of fast fashion. Before I travelled to Gujarat I ordered two maxi dresses from a well-known British fashion forward website which I obviously won't link to. I wanted dresses that were arm covering, lightweight, crease-resistant and which I wouldn't be too upset about if my luggage got lost in transit (which it did). I must admit it was a revelation to be able to choose my exact size and to find a petite fit - I'm used to taking my secondhand finds in and up! As you probably remember from my subsequent travel blog posts, I wore both these dresses more or less constantly and I was amazed how many people in Gujarat approached me to tell me that the fabric they were made from was produced in India. The dresses survived the trip and are packed away in my travel case so, in my case, they weren't throwaway but while I was happy with them, I didn't love them and certainly wouldn't wear them at home. The kimono style dress is full of static but, as I liked the style, I got a tailor in Goa to run me up a copy in some vintage block printed Indian cotton.. The company I bought them from has a decent ethical policy and regularly checks on its workers and their working environment but it's not good to be able to buy two brand new dresses for less than £12, is it? I can understand why our charity shops are stuffed full of fast fashion, who feels guilty about giving something away that cost less than a pizza? If I'd been better organised I know that could have found dresses to match my criteria secondhand and altered them to fit. Although I was satisfied with my purchases I won't be doing it again - nothing beats finding the perfect thing secondhand, does it? 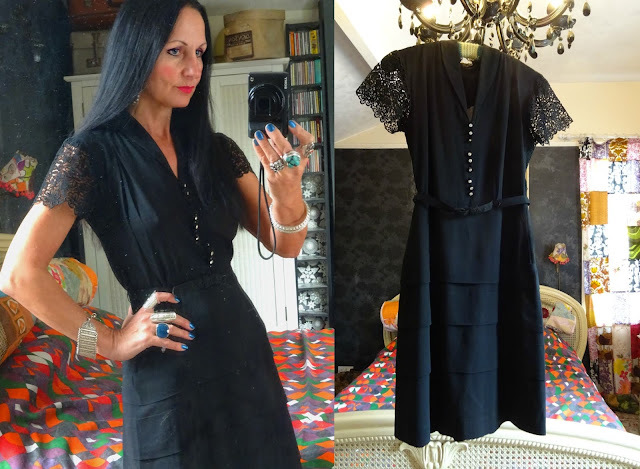 When I realised that I needed something smart & fairly conservative for a funeral I'm going to tomorrow I didn't go searching the internet for a cheap black dress with next day delivery, I took myself down to Walsall's charity shops and scoured the rails for something suitable. In all honesty I was fully expecting to end up with some drab high street dress which I'd donate back once it had fulfilled its purpose so I was amazed when I came across this 1940s crepe day dress nestling amongst the mediocre high street cast-offs. I had thought I'd sell it on when I'd worn it but the fit is so good it's a keeper. Who needs to buy new (and further pollute the planet) when fabulous pre-owned treasure is readily available? Yes, it takes hours of dedicated searching, the washing machine is constantly on and I've lost count of the number of buttons I've replaced, linings I've repaired and hems I've resewn but secondhand clothes still rock my world! Clockwise from top left: Third Eye 1970s block printed maxi skirt (mine! ); Rayon kurta with mirror work; 1970s Korean vinyl Penny Lane jacket; 1970s silk Indian maxi (mine! 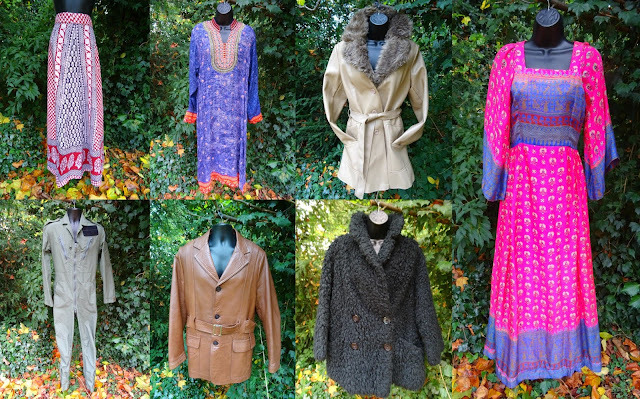 ); 1960s Bickler shaggy fake fur snuggle coat; 1970s belted leather jacket; Royal Air Force flying suit. We're trading with Judy's Affordable Vintage in Leamington Spa on Saturday (HERE). We haven't traded with Judy's for ages and I'm looking forward to catching up with our trader friends but dreading the load - the stairs are bad enough when my hip's normal. I loved those dresses you bought in the Summer. So few people who buy new buy things because they genuinely love them, it's like their on a treadmill where they are constantly having to update their wardrobes. It's depressing. I'm with you 100% of the way. Second hand all the way with the very occasional new purchase. I always find nicer things in charity shops etc than I see in the shops. In fact I rarely even bother going into to any of the high street stores that sell women's fashion. Your outfits are fabulous; I cannot believe that is a nightdress! It's more like a flamenco dancer's dress. I love the wool maxi what a marvellous buy. 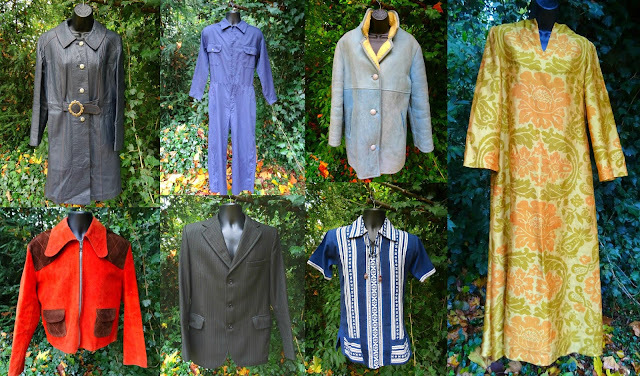 And of course the amazing treasure trove of wonderful garments you found on your shopping trips. I continue to be astonished in every post! The orthopaedic surgeon told me that my right hip would last around 5 years before it needed replacing - that was 7 years ago! It has it's moments but has been okay for a while. It's lots better today, phew! Well I’ve come to the conclusion the four of us might be a bunch of demics healthwise but we sure as hell are the most stylish individual demics for miles haha. Hope you are both back on top form soon. I’ve got an mri scan to look forward to in November and Philip has an X-ray on his chest next week. It’s been a treat to catch up on your lovely blog and what you’ve been upto. Aren't we a bunch? Jon's till waiting for his steroid injection, just to add to our woes! Ack - sorry about your hip - I know what it is like to walk around in pain. Any idea if you get surgery soon? I'm with you, I absolutely don't buy anything new clothing wise unless I absolutely have to. I can count the pieces in my closet on one hand that I bought new (some of them 15 years ago before I was a serious thrifter). I even manage to find decent shoes once in a while. The only thing I have a hard time finding is coats, not sure why. I did find a great rain jacket a few weeks ago just before our trip to the other side of the island (expected rain). I've been looking for a few years for a decent one at the thrift, sometimes it just takes longer. I suppose I could ring my surgeon and have a chat but I'll probably just stick to sensible shoes and keep taking the tablets. I want to put my next op off as long as i possibly can! I hope your hip will be fixed by surgery or otherwise soon. You are too active to be held back by restricted walking. What a clever idea to have the tailor in Goa replicate the dress you liked. You will look wonderful at that funeral, what a very lucky find! When your curvy and flabby, it is hard to fin much second hand that isn't frumpy, but I try. My girls love a good second hand find, but both are thin and options abound, it seems. I'll keep looking for gems for myself. I'm sorry your hip is giving you pain and hope you get it sorted soon. I try my darnedest not to buy new clothes. I do sometimes (I'm only human) but the quality is such crap I always end up wishing I hadn't. So sorry to hear your hip is plaguing you. I'm sending some healing thoughts your way. You are preaching to the choir of course. I've been reading back in my blog and see that I've been writing about this for almost seven years now. I feel like I'm spitting into the wind. It is very frustrating. https://www.youtube.com/watch?v=1IRtRnV92AM that was about what the lux brands are doing and it was awful. So much for transparency. On a positive note your secondhand nightie is glorious! What drama! How I'd love to find something similar. Sending you luck for sales this weekend! Thanks, Suzanne. I'll try and catch that documentary, might be a good way to recall my schoolgirl French! i too always loved 2.hand clothes - the older the better. everytime i bought something new i regretted it - it was´t worth the time spend in the changing room - not to talk about the money. and since i left my youth behind, modern stuff does not even fit me - not to a minimum. later i learned about sweat shops - and this was the final call. i was a worker in clothes fabrication too and i feel solidarity with the people who have to work under such katastrophal circumstances. and because i must by my undies & leggings new i try to use them as long as possible.....gentle washing, replacing elastics and mending holes included. I'd forgotten how good 40s clothes make me feel! Well, I feel a bit lazy because I wear only Indian-made clothes & only buy new (vintage is rare here in South Asia). But I wear them 'til they fall to pieces or donate them to the maid. Sadly, they ship plane loads of Nepalis to work in sweatshops in Hong Kong & S Korea. 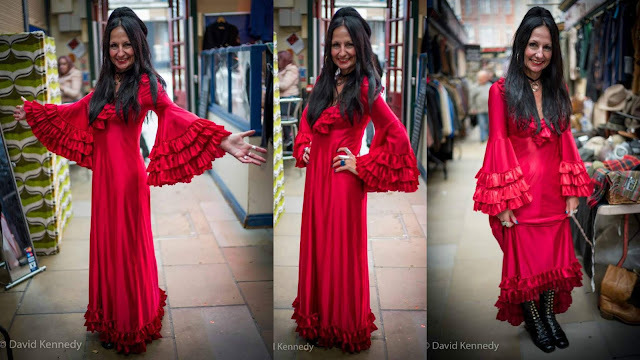 Loving that scarlet nighty on you & the kurtis & kaftans for sale in your photos look divine! Hmm this has given me something to think about. I rarely buy new and try to buy secondhand/vintage clothes that I really really like, but of course sometimes I make mistakes and donate them back to opshops if I realise they don't suit me and can't find a way to fix them. 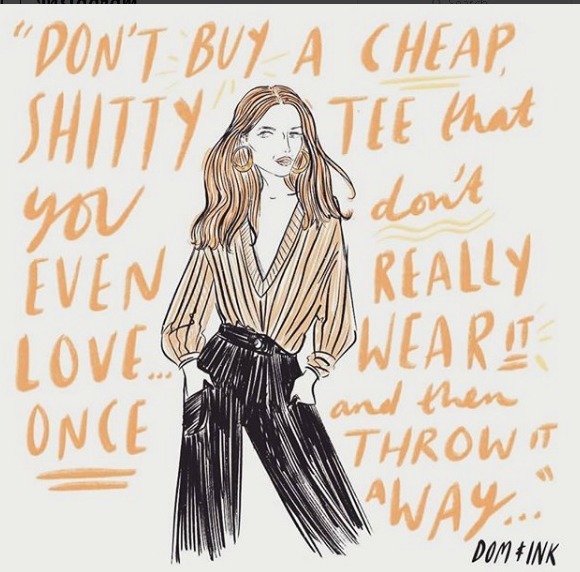 I've noticed your 'styling not shopping' posts on instagram and might join in now that I've read this post and understand what you mean by it. Three night shifts? Gah! I hope you found something to wear and the occasion wasn't too sad. I love the #stylenotshopping idea. I do buy new, or I have bought new, but Stacey Dooley's documentary scared the hell out of me. I always prefer my pre-loved buys so I'm going to avoid the high street from now on unless I really need something new - underpants for example. It's all about being mindful, isn't it? Not giving in to impulse buys just 'cos they are cheap. Everyone in Walsall seems to walk around with one of those huge Primark bags in one hand and an energy drink in the other. I'm not sure which is destined for the bin sooner! My local chazzas have really deteriorated since Primark opened here - I'm delighted never to have set foot in it! Sorry to hear about your hip, I can relate because I have health problems as well. Rest and take care....often that's the best thing to do. I love walking too but sometimes we just have to say no and stay in bed. I've been down with high fever since yesterday so I'm only leaving the house to go to work and I'm going home straight back. I love Ari Seth and his work, it's great that he's advocating this important cause. I do accept clothes from fast fashion brands from time to time - I sometimes order it for friends. It's seems a shame to say no to something that is being gifted...but frankly, new clothes never have the same appeal as vintage ones. 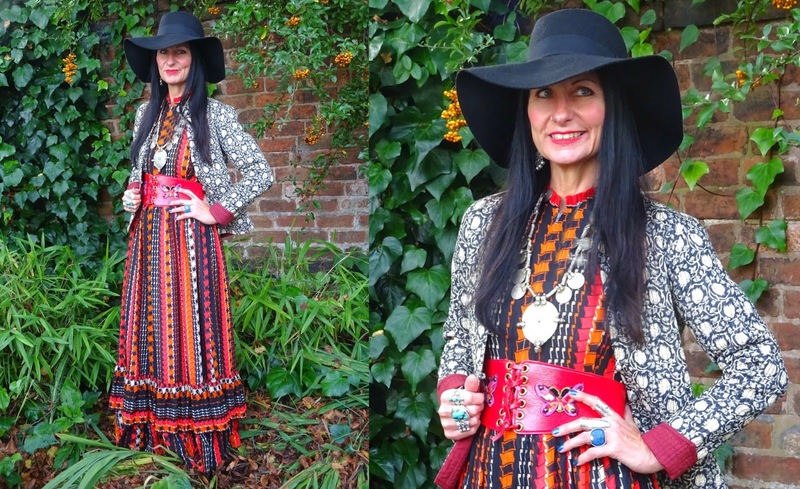 It's not just that the vintage finds are more quality made (especially the old ones) but they just feel better, I love clothes that has history....and vintage finds are usually so unique! For me the most interesting things about clothes are the stories we create with them- and you can't really make memories with clothes if you buy into fast fashion philosophy. Thanks, Ivana and the same to you. I hate feeling out of sorts, I'm a dreadful patient! I'm delighted that Ari decided it was more important to speak out about fast fashion than worry about offending the odd follower. Great post - I would so love to come charity shopping with you - you have such a great eye! I guess it comes with practice and dedication! I gave up buying new clothes for the whole of 2015 - and whilst I cannot say that the fabric is necessarily ethical, at least having made them, they fit well, I love them and I keep them forever! I do look in charity shops and have found a couple of little gems, but I am afraid I'm addicted to stitching. I VERY rarely buy anything new, and sInce watching the Stacey Dooley programme I have resolved to be even more determined to buy second hand or make my own. Hello Gill! Lovely to hear from you. No new clothes for the whole of 2015 was a real achievement. You're right, the more time you spend charity shopping the better your skills become. I've got it down to running the back of my hand along the racks and picking out the things that feel good - they're inevitably vintage or quality labels. I should have had a second replacement six years ago so I'm living on borrowed time.That being said I'm pain free today, just walking terribly - I can live with that! I'm sending some healing thoughts to your poor hip! Please, take care of yourself!. I have to recognize that sometimes fast fashion is really appealing and I've bought cheap stuff too, but not anymore. I always try to take informed decissions (even if I know it's not the most popular thing). At least, blogosphere is a feast for the eyes!. Your red nightie looks like something too fabulous to keep it at home!, those sleeves are so delightful! And you look gorgeus in your maxi and quilted jacket, absolutely fabulous layering!. Even your black dress is particularly cool and elegant, glad that you're going to keep it!. And I totally agree, nothing beats finding the perfect thing secondhand! I'm sorry to hear your hip's been so painful, I hope it feels better soon. It amazes me that the prices for cheap fast fashion at the thrifts are the same as the better made pieces -- new or older. I won't buy a brand at a thrift that I wouldn't buy new. Even if the price is lower, anything I buy needs to hold up. Love the red nightie and boots -- very Flamenca! I do hope your hip feels better and that rest and anti-inflammatory meds are offering some relief. You are a star in every outfit, but wow, I'm boggled by how different a look the black dress is on you. I do think it has enough "Vix" in it to be suitable for both YOU and the event. The red nightgown is far too stunning to not be out in public. Like many others commenting here, preaching to the choir. I do love to shop, but I will not buy fast fashion new (guilty of sometimes picking up a piece second-hand, though). It horrifies me how wasteful as a culture we have become. Thanks, Sheila! My teens and early 20s were mostly spent wearing 1930s and 1940s clothes - it felt very strange to wear that style again! I'm sorry to hear your hip's playing up, that's really rotten. I hope it feels better soon - at least you can rest it in your own bed, not at festivals now. I've really struggled to find much I like secondhand of late - the perils of being plus size! But I've followed Michelle and will try to IG a couple of from-the-closet looks. Thanks, Mim. The pain's gone but Jon says I'm walking appallingly badly, I can live with that but I don't think he can! My mum is having similar issues to your hips but with her knees- she is in agony a lot of the time but tries to make herself keeping walking around but then sleeps very badly- not sure whether she will have the replacement treatment or not soon. 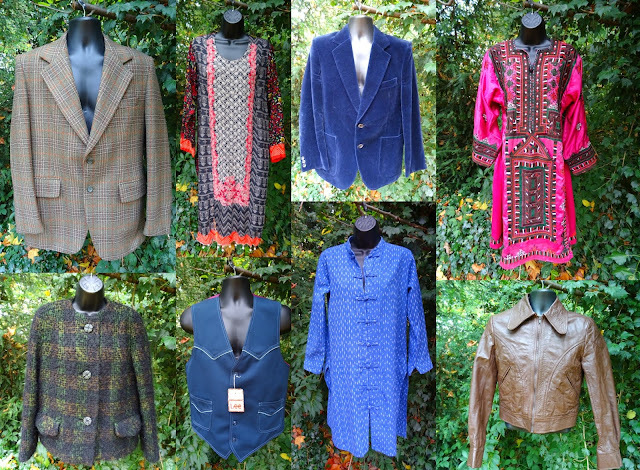 I don't buy much new clothing to be honest unless it is new from someone on eBay that they bought unworn- I just find the High Street super boring and not at all special-most of my cherished items are second-hand. I do buy basics from the High Street like leggings though- I prefer wearing them to tights nowadays- I just find tights annoy me! I DO think I need to have a break from buying anything at all though- you are right about that- I need to shop my wardrobe more- mind you, most of the bits I buy nowadays are Dr Who bits! Your poor mum. Jon's having steroid injections in his most troublesome knee in a fortnight's time as the doctor says he's too young for a replacement. What a state we are! I can join in with the rest of your followers who sing the praises of secondhand shopping. I will only buy something new if I can't find it used (like good comfortable shoes) and of course, socks and undies, and I find I will more new things from local, owner-run businesses in the summer because it's hard to find nice work-appropriate summer clothing in the thrift stores here. That nightgown is much too glam to be kept inside, and the black dress is a lovely quality piece that was waiting for you to come along. I'm sorry your hip is giving your grief. My right hip has been dodgy for some time now (the doctor suspects "bursitis") but I keep hoping it just needs stretching. Despite your hip problems, you look simply divine in all of your outfits! That lovely black 40s dress is gorgeous on you, so sorry you had to use it for such a sad occasion, but I'm sure it will have many happy ones too. The red nighty is such a feast for the eyes, it would be a crime to not show it to the world. You are a great example of someone who creates a thoughtful, individual and planet friendly wardrobe. Though majority of people probably prefer a quick fix simply because life seems so overwhelming these days. I have many secondhand items, not only clothes and accessories, but also home stuff - dishes, blankets, etc. I do shop at modern shops, not sure whether you'd call them fast fashion - I never find dresses for $12 or even $20, and I do care about the quality. Though, I bought a few cheaply made items in the past, an I regretted some of them. I try to treat them with care and get a lot of wear from my wardrobe - definitely not to change my wardrobe every season or so. I am all for a more mindful approach to life, but yes, some habits are hard to break, and like Ari, I wouldn't want to sound too preachy and condemning about it, after all we all have blind spots. Lots of love and thank you for this thought provoking post! Don't be shy, if you enjoyed your visit leave a comment, I can come and visit your blog if you do.